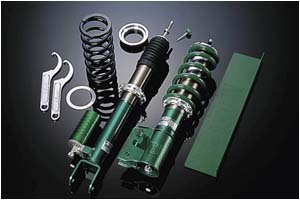 TEIN's experience in Tarmac racing has led to the development of HT dampers for Gymkhana and Auto-X competitions. The damping force curves and spring rates have been chosen for optimal grip on tight courses. Separate compression and rebound adjustment (16 x 16) enable fine tuning to match any driver to various course layouts. HT is intended for those seeking quick and crisp response on all types of surface conditions.